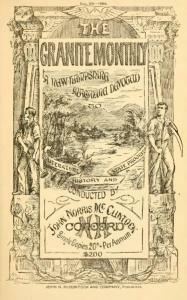 The Granite Monthly was a New Hampshire publication that covered news, issues of import to the society of the time and general interest articles. It now joins over 70 other valuable primary source indexes that enjoy easier discovery with one searchbox in 19th Century Masterfile. The Granite Monthly file in 19th Century Masterfile contains nearly 20,000 primary source records from 1877-1930. Most of these citations conveniently include links to HathiTrust, taking the user directly to the full text, where available. You can begin your exploration of 19th century New Hampshire today with 19th Century Masterfile if you already have access, or contact us to get set up for a free trial to the resource.